Ingham’s Powder Coating offers hundreds of colors and textures, including glitters, candies, veins and clear coats. We offer all of the colors available through our powder suppliers, including FDA and USDA approved coatings. A few of the many available powder coating colors are shown below, but you can view additional powder coating colors in the Tiger Drylac line (one of our suppliers) by visiting their website, at www.tiger-coatings.us. 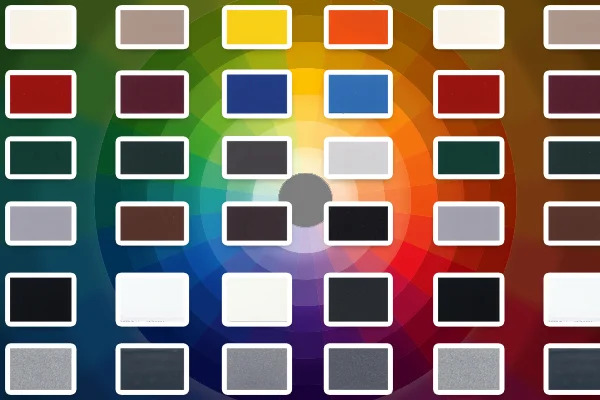 You may also click on this link to see our stock color options or stop by or contact us for questions about specific powder coating colors and finishes for your application. If it’s metal, we code it. With new regulations requiring tested chains, binders and tie-downs for securing loads, history indicates that the cost of these items will rise. Loss or theft of these items has always been a problem, but with Ingham’s Powder Coating program, your company will be able to more easily track and identify your property. We can color code items such as chains, binders, shovels and other metal items for their usable life at a minimum cost.